After the unexpected ending to Truthwitch, Windwitch brings even more surprises. Enemies become allies and must work together to save themselves. Characters are put into difficult situations, and they are forced to think quickly. Their growth is amazing to watch, as we get to see characters mature and become stronger. While many questions are answered in the sequel, there are still many more that we haven't learned yet, and that makes me so excited for the third book in The Witchlands series. At the end of Truthwitch, all four characters were scattered across the Witchlands: Safi was heading to Marstok, forced to work for the empress; Merik was trying to help is suffering country; Iseult was trying to figure out who she was and save Safi; and Aeduan was off on his own mysterious (as always) endeavors. 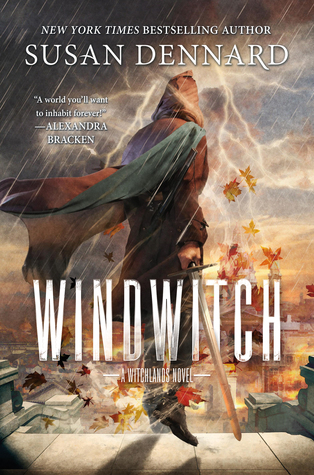 But at the beginning of Windwitch, everything is upended. People are killed, alliances are formed and broken, and no one knows what to do or what the future holds. All they know is that they must survive and do what they can to save those around them. Windwitch is very character-driven. The choices they make directly impacts what happens. One wrong move and they're driven into a corner and will do anything they can to get out. Since all of the main characters are spread out, they're forced to survive on their own, and we get a better chance to understand them in these situations. New characters are introduced as well, and even though some are small, they are just as instrumental. The alliances that are formed change the outcome of events, so the characters must fully weigh all their options before they act. We also learn more about the Witchlands. We get to see new countries and meet new people. We find out how each group of people is impacted by the events for Truthwitch. And some of these groups are not too happy with them. This poses a huge challenge for all of the characters, as many decisions could mean the difference between life and death. This uncertainty kept me on edge, turning pages as fast as I could. Sadly, due to this semester, I had to take a break after about 250 pages. When I finally got back to it a couple weeks later, I was so excited to get back and read the last 150 pages in less than an hour and a half. This was probably the fastest I've ever read, because I had to know what was going to happen next then and there. Overall, this was a thrilling sequel to an amazing fantasy series. Its fascinating characters kept the book moving with its fast pace. It leaves you second-guessing your predictions and wondering if people truly are the enemy. I can't wait to get my hands on the third book of The Witchlands series. This series has been a thrilling adventure, and we're only halfway through it.